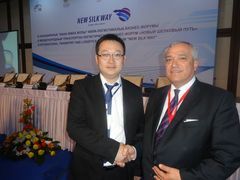 On 21 May 2015, the meeting was held between Mr. Mircea Ciopraga, Secretary General of the PS IGC TRACECA and Mr. Xu Qiangqiang, Representative of the China Master Project Logistics Center, Central Asian Department. Mr. Qiangqiang and Mr. Ciopraga discussed current activities of the China Master Logistics (CML) Company and its Central Asian department which is based in Kazakhstan. Being National 5A Class Integrated Logistics Enterprise, the core business of China Master Logistics Company includes liner service, freight forwarding, TCR logistics, airfreight express, customs clearance and guarantee inspection, container depot services, consolidation logistics, heavy hauling and etc. CML`s overseas service network spreads over countries and areas such as North and South America, Europe, Central Asia, Far East, Middle East and Southeast Asia. Growing logistics network keeps bringing CML inexhaustible power and progressive strength. CML service network covers the major ports and areas in China and extends overseas, based on the modern logistics management system with the features of multi-network, multi-function and interactive coordination, which fully supporting by information technology. Mr. Ciopraga and Mr. Qiangqiang exchanged views on possible ways of direct cooperation and through representation in the region as well as advantages and benefits of mutual collaboration. Mr. Ciopraga mentioned that further dynamic and effective development of transport communication is always in the high priority of TRACECA Strategy. Geostrategic situation of the region’s countries, especially the countries of Central Asia adjacent to intensively developing China are among the main factors. At the same time, taking into consideration the intention of TRACECA to actively involve China to the latest activities, Mr Ciopraga emphasized that the support of Central Asian countries and namely Kazakhstan are of great significance. During the meeting Mr. Qiangqiang mentioned that CML not only meets the different needs of customers, but also pays attention to the safety of environment and human in logistics operations and in this regard could represent interest for TRACECA region as one of the aspect of future cooperation within technical assistance projects.